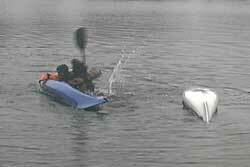 When I began teaching, I taught my students to get to the capsized boater quickly to affect a speedy recovery. That was until I encountered my first panicked swimmer. After that experience, I trained my students to be speedy, but cautious when approaching a capsized boater. Since my unfortunate experience, I have observed numerous basic kayak classes taught by other instructors and I still see students being taught to charge in to help a capsized boater. Let's look at what can happen to the unsuspecting helper if they throw caution to the wind and then review the way I recommend you approach any boater who has capsized. 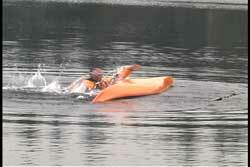 In this example, the assisting kayaker approached on the same side as the paddler in the water. They were speeding in to help. 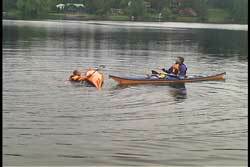 As the helper got close to the swimmer, he realized the paddler in the water was not responding to his inquiries. The swimmer was panicking and he wanted to get out of the water. 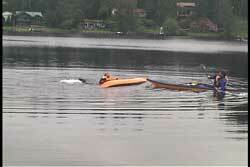 Since the second kayak was right near by and it was upright, the swimmer tried to climb on. 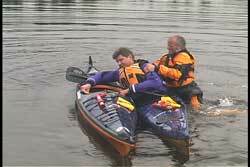 As he tried to get up on the kayak, the paddler in the cockpit instinctively went to use his high slap brace. The brace was not strong enough to keep him and the boat upright. Unfortunately there are now two paddlers in the water as a result of not considering the consequences of approaching a swimmer not knowing if they are calm or panicked. As a side note, a different type of brace may have worked, but this is not a bracing article. See USK article, "Extended Paddle High Sculling Brace." The first thing you should start learning is to recognize the characteristics of a person who is panicking in the water. It is obvious when they are splashing around as Bill is doing here in the picture. The splashing swimmer is a blessing, because it they are easy to see as you are approaching. It is important to understand that panic manifests itself in many ways. The one that I found the most disturbing was the swimmer who responded to my initial instructions, but suddenly was obsessed with climbing on my kayak. I have also seen the catatonic swimmer who did not respond to any directions nor make any sounds or show any movement. I actually had to make physical contact with them before they snapped out of it. You better believe my kayak was stabilized before I touched them. I once saw an instructor hit a swimmer in the helmet, with their paddle, to snap the swimmer out of their panic mode. It was during a river class. I have had to resort to shouting to break the panic cycle. Since my first panicked swimmer experience many years ago, I now approach unknown paddlers in the water with caution. I make sure to keep the swimmer's kayak between them and me. I have come to appreciate the great support you can get from another kayak, whether it is right side up or overturned. As long as there is adequate floatation in the capsized kayak you can use it as a stable platform. As a side note, that is why I am particular when I paddle with others. I personally check the gear of the others in the group. If there is gear that I find questionable, I will either ask if the problem can be remedied or I bow out of the paddle. I have learned that it is usually best to avoid the situation rather than trying to deal with an emergency. Even though the bottom of a kayak is slick and slippery, it will still provide great support if you commit to lying over it. I also like to use paddle bridges spanning both kayaks. 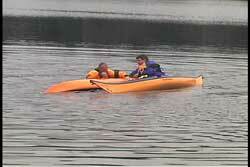 I will usually lean all the way over and try to hug the other kayak regardless if it is upright of capsized. In this instance, the panicked swimmer it trying to grab me and my paddle, but I am holding on tightly to my paddle and resting on the capsized kayak. There is no way this panicked swimmer can pull me over their kayak. I am now in a secure position to try to calm the panicked swimmer down and then continue with the capsize recovery. If they were not panicked we can quickly discuss which recovery technique to use and proceed with the recovery. Let's say I did come in on the same side as the panicked swimmer. My best defense at this point is to come in quickly and grab the swimmer's kayak as quickly as possible. As soon as my body is next to the other kayak (either the bow or stern of the swimmer's kayak) I use my paddle bridge to give me some support. I use my momentum to slide to the center of the kayak. As before, I securely grab the other kayak for my own security. In this example, I asked bill to try to pull me over. He did everything he could, but he was unable to capsize me, because I had his kayak in my grasp. It is also possible to get into this position if the panicked swimmer comes around the kayaks after you arrive on the outside. Just to finish off the possibilities, here is Bill on the outside trying to pull me over. Bill is over six foot tall and weighs over two hundred pounds. I am resting on his kayak, with my paddle bridge and holding his cockpit coaming. As before, I asked Bill to do his best to pull me over. I told him lunch was on me if he could do it. Bill did his best and did more than any panicked swimmer would try. Here he is halfway out of the water and trying to use his body weight as leverage to pull me in while I held his kayak. 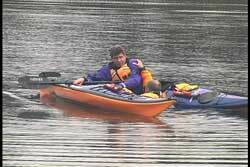 My biggest concern was Bill ripping my PFD or dry suit. He never even got close to getting me over. As you can see, regardless of how the swimmer tries to pull you in, if you have a good hold on their kayak there is no way you are going in. Therefore, as you approach a paddler in the water, be sure you can get to their kayak before they can get to you. I still approach a capsized paddler quickly, but when I get close enough to the swimmer, I slow down and I begin my recovery dialog. "Are you OK?" "What is your name?" "Do you want any assistance?" "If you want assistance, what can I do to help?" I am hoping to get reasonable responses. If I get any indication of panic, I try to use some calming methods. I first try to direct them to a task. I shout directions out loudly. Most panicked swimmers do not have a hold of their paddle. If the paddle is nearby, I tell tem to grab their paddle. I have even asked to them to pat themselves on the head just so I can see if they can follow directions. While this is going on, I have their kayak between me and them as mentioned above. As long as I have the safety net of their kayak, I feel secure even if I misjudge the situation. Therefore, if you want to stay upright around a panicked swimmer, get to their kayak before they can get to you. Approaching from the outside with the capsized kayak between you and the swimmer is the most conservative approach and the most reliable for your stability.